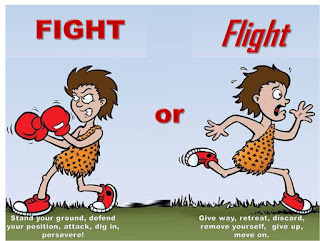 "When the going gets tough, the tough gets going" When faced with adversity, our fight or flight defense kicks in. However what dictates if we fight or flight, the situation. Some will say it's innate, which our inborn nature to stand up and face the situation or flee. Others will say we learn it from our environment and is therefore thought when to fight or flight. Whatever school of thought you subscribe to, it is important to know where you stand. As the Kenny Rogers song says " know when to hold, know when to fold and know when to walk away". Fight for what you believe in, stand-up for what you think is right and walk away when it is time to let go. I truly believe both works hand in hand you have an innate response to a situation but culture also plays a role. This year has taught me a lot about my drive and willpower and I am more in tune with myself. So don't become discouraged and beat yourself up but instead embrace the choice you make and use it as a stepping stool.